Madeira is a Portuguese island, which lies several hundred miles southwest of the Portuguese coast, far into the Atlantic ocean. Mountainous and dramatic, Madeira is a lush, fertile outcrop, with a semi-tropical climate that supports a broad array of horticulture and agriculture, from banana plantations to exotic flowers. It also grows grape vines, for the production of Madeira wine. The drama begins as your aircraft makes its approach: flat, level land is almost unknown on this rugged volcanic island, so the aeroplane wheels round low over the water, to land on a runway constructed on stilts out into the sea. It is all very modern and substantial, and not nearly so terrifying as it sounds, but it gives some idea of the problems such a landscape presents. Vineyards are cut in terraces, much like the Douro Valley, rising up 45 degree slopes. Those on sea-facing cliffs have little stone and raffia barriers to protect them from the spray during stormy winter months, and offer some respite from the baking heat of summer. Most visitors will stay in Funchal, on the southern coast, the capital, major city and port of the island. Funchal is a lovely colonial-feeling old town, with fine botanical gardens and parks, and a good array of shopping and eating possibilities. It houses a number of good wine shops. My favourite was Diogo’s Wineshop opposite the Infante Shopping Centre in the Avenida Arriaga (number 48). The shop is owned by Vinhos Barbeito, but sells a large range including very old Madeira wines and Ports. Rather like its mainland cousin, where the Port lodges of Villa Nova di Gaia are many miles from the Douro Valley vineyards, Funchal and its suburbs is home to the Madeira lodges, whilst a network of small vineyard farms stretches across the length and breadth of the island. Blandy’s wine lodge and visitor’s centre is at 32 Avenida Arriaga. There are guided tours and tastings in this 17th century lodge, part of an old Franciscan monastery, including a look at the cooperage and a short video film. Tours daily, except Sunday. The Madeira Wine Institute sits opposite Funchal’s town hall, at 78 Rua 5 de Outubro. It is the governing body of Madeira wine production, and they have a museum and plenty of literature on Madeira wines. Admission is free. Apart from wine, Madeira offers a lot to the tourist. It is a compact and fascinating island, with absolutely breathtaking scenery. By hired car you can explore more or less the whole island in a few days. Meandering along the older, small roads is delightful, but the mountain passes and torturous twists and turns mean progress is slow. If you need to get somewhere fast, use the motorway, most of which is brand new with the help of EU grants, including miles of tunnels and dramatic high bridges spanning the valleysThe island is criss-crossed with excellent walking and hiking trails, many of which follow the paths of the Levadas, little irrigation canals which carry mountain water to farming land. The Tourist Office in Funchal (18 Avenida Arriaga) will provide a map of designated routes. On the wild northern coast there are fantastic drives which cling to cliff faces, some passing under tumbling waterfalls. One of the best connects the towns of São Vicente and Porto Moniz. Each has decent restaurants, and the latter also features an amazing set of lava-rock-pools. These trap incoming sea water, which is heated by the sun, transforming them a very popular bathing lido. Back down in Funchal, you can take a cable car that skims over the rooftops and up to the historic town of Monte. One of the tourist-trappy attractions for many adventurous visitors is to come back down the fast way, on a toboggan which hurtles over well-polished cobbles, plummeting through the twisting streets. The only thing between you and disaster, is a pair of tobogganeers in traditional costume, who half push, and half restrain you through the narrow alleys and blind bends. Not for the faint-hearted. I stumbled across this site on the web, which is a no-frills personal site, but has extensive information on Madeira wine, including an excellent self-guided wine-walking tour of Funchal: Madeira Wine Guide. If you are looking for sandy beaches, all-day breakfasts and all-night clubbing, then Madeira is definitely not for you. With something of a reputation as being for an older, moneyed set of travellers, Madeira boasts more 4 and 5 star hotels than any other resort I can think of, as well as more high quality restaurants. That is not to say the island is bumbling along into its dotage: there are plenty of pubs, bars, nightclubs and a casino, but there is a refusal to cater for lager-loutish tourism, and an emphasis on more mature, dare I say it, sophisticated travellers. For an overnight stay in Porto Moniz, the hotel Moniz Sol looked attractive, with rooms from only 35€ (about £25) per night. I enjoyed a fine, but simple fish lunch washed down with some Vinho Verde, in the restaurant Orca built right above the rock-pools with great views. 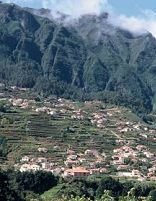 However, most visitors will base themselves in Funchal. Hotels tend to be clustered to the western edges of Funchal, along the Estrada Monumental. Madeira’s most famous hotel is the 5-star Reid’s Palace, about a 15 minute walk from Funchal’s centre (uphill for quite a lot of the way). I dined in Reid’s (see below) and enjoyed a drink on its terrace, but decided it was too stuffy for me to stay there. A real homage to Victorian England, afternoon tea is an institution, the Billiard room is a smoky all-male den, and a jacket and tie are required for the main dining rooms. Not for me. I have stayed in the 5-star Cliff Bay, a few minutes further out of town, and the comfortable Pestana Casiono almost next door. Fine dining is a highlight of a trip to Madeira. You can pay very little for simple food, pizzas and pastas in any number of places, but there are also half a dozen restaurants of international, Michelin-starred-type quality. A run-down on some of my favourite experiences follows, but before that remember that this is a Portuguese island. What does that imply? Well, excellent coffee, cakes and pastries can be found almost anywhere, and menus are built around meat and seafood; this is not a great place to be a vegetarian. Mainland Portuguese wines are available everywhere, including the best of the new wave from the Douro and Dão. Before we come to some posh dining options, one of my favourites was this little restaurant right next door to the Crowne Plaza hotel. Homely, yet clean, bright and smart, this is an old-fashioned place with lots of flambéing at your table and a no-nonsense menu. One of those established family restaurants were everything works like clockwork, start with delicious garlicky flat bread, then Espetada, chunks of beautiful quality beef skewered on a laurel twig and cooked over a wood-fired grill. You will see the similarly-named Espada on every menu; this is actually a fish from native waters (the extremely ugly scabbard fish) which is as good as it gets in this restaurant, but is still a little spongy and tasteless for my palate. Moderate prices (2003). Not a Chinese restaurant, but a bustling Portuguese café/restaurant on a busy corner just opposite Blandy’s Madeira Lodge. Outside are pavement chairs where tourists collapse for a cold beer of coffee and pastry. Snacks and sandwiches will fill a gap, but are nothing to write home about. Inexpensive to Moderate (2008). This charming villa restaurant is part of Reid’s Palace hotel. Within Reid’s, the fine-dining Les Faunes has a great reputation, but the jacket and tie restriction put me off (though in the main Dining Room, most guests actually wear formal evening wear!). Villa Cipriani is an Italian restaurant which was really excellent. There are panoramic views looking back to Funchal port, and terrific food: my tagliatelle with lobster in a cream sauce was sensational. I broke from my rule of drinking Portuguese here, and chose a bottle of Feudi san Gregorio’s gorgeous Fiano at a reasonable price in this very chic place. Expensive (2008). This dining complex is based around a beautiful old house, just to the west of the city centre, and is one of the island’s gourmet hot-spots. I ate their twice during my stay in the restored Quinta which is very grand without being pompous and is overflowing with somewhat kitsch objects d’art. There is a terrific wine list here, of both the best Portuguese and international wines, and some very good cooking. There are nods to nouvelle cuisine, but all from Portuguese roots, with lots of inventive combinations, like a fine avocado ice-cream dessert. Do ask the sommelier for advice too. Expensive (2008). Lovely restaurant, if a little tourist-trappy I felt: tell-tale signs like waiters in rather kitsch uniforms, who keep their eyes on the door and pay you no attention as they scribble down your order. The food was good and based around seafood, if a bit over-priced. Expensive (2003). Madeira could be a little sedate for some, and it is a hilly place for sure, but it is also utterly charming with bountiful, verdant countryside, some spectacularly rugged scenery, and a really sophisticated hotel and restaurant scene. Add in the attractions of the Madeira wine and mild year-round climate, and it is a very attractive destination for a week-long break.